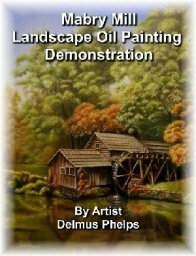 I purchased your eBook, Mabry Mill Landscape Oil Painting Demonstration and read it from cover to cover. Then I did a painting of Celosia. Our granddaughter gave me Celosia to include in my flower garden on Mother's Day a year ago. This year on Mother's Day, she gave me a pot of Celosia in a big pot that I keep on our porch. And it became inspiration for a painting. And I modified the steps for acrylics. I love this technique. This is my first and only painting with the Flemish techniques. I first discovered a portion of it on another site where they used the grisaille layer, and then the colorful vibrant details. And it was so beautiful, I started searching for the technique, and discovered it was a step of the Flemish technique of the 15th, 16th and early 17th centuries. Then I discovered your site, and the book Mabry Mill, and read it. I first began painting 18+ years ago with traditional oils. Then later, I began painting with watercolors, and fell in love with these too. Several years ago I started painting with acrylics and love this medium for their quick drying time. But I still love my oils too. And my next painting is going to be the Flemish technique with the oils. I will modify it somewhat to keep each step simple, and although I will stick with all the layers, but I want to try every underlayer in soft light colors with the lights, mid-tones and shadows. I am what some would refer to as a self-taught artist. I have never had schooling for art, one year in jr high school, which to this day, I didn't come away with anything. I remember one drawing outside, and beating on some metal and then painting grapes on this metal. Speaking for all of us, who have purchased your eBook, Thank you for sharing with us. Your art is beautiful. 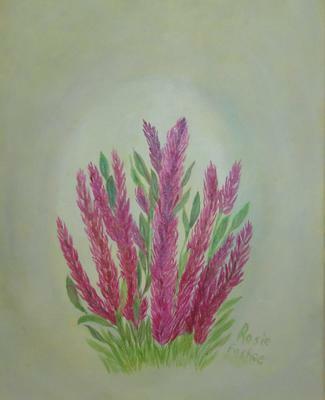 The Celosia painting is beautiful, thank you for contributing! And thank you for the kind words concerning the eBook! Yes, you can modify the technique, doing some of the under paintings with acrylic, then moving to oils in the final stages. I especially like using it in landscape work. Will enjoy seeing more of your botanical paintings!